Right now there's a bike that offers everything you could have dreamed of...and more! Surf the net and check out the rivals. And you'll see that nothing in the 125cc class can match what our latest Yamaha YZF-R125 has to offer. This remarkable motorcycle has been developed using the same advanced technology that makes our larger capacity R-series models some of the most respected bikes on the street and track. Its radical bodywork is a direct spin off from our World Championship winning R6. 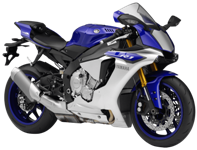 And with features like upside down front forks and an aluminium swinging arm - as well as a short-stroke liquid-cooled engine, plus ABS as standard - the latest YZF-R125 is built to thrill.